Art is in Adrienne’s blood. Along with Jackson Pollock, William de Kooning, and Franz Kline, her uncle, Albert Kotin, was a founder of the New York School of Abstract Expressionism. Adrienne is co-founder of Doubletree Gallery in Upper Montclair, NJ and The Clay Cellar, a pottery center in Livingston, NJ. She’s also a member of the Potters Guild of New Jersey and has taught at the Montclair Adult School and the Newark School of Fine and Industrial Art. Adrienne’s work is in many private collections throughout the United States. 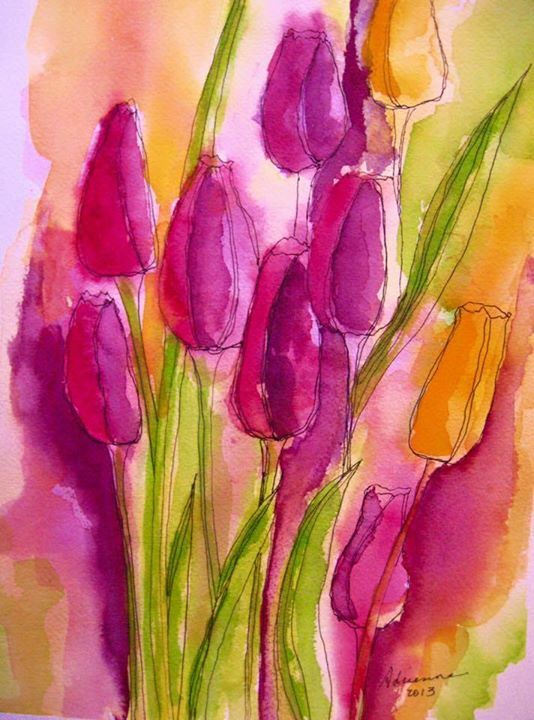 She recently presented a one-woman show of her watercolors at the Montclair Public Library Gallery, and her work has been selected for the cover of the May in Montclair booklet for the second year in a row. Adrienne’s original watercolors sell for $125 and up. The Artists’ Market is currently showing several of Adrienne’s most recent original watercolors.